Order your FREE Phoenix property value report today and get more than just a number – get the details! There is absolutely no cost or obligation for this valuable service and you will not have to speak with anyone. Curious to know how much your house value has risen? Why spend $450-500 for an appraisal when all you need is a solid idea of your Phoenix home value? Everyone knows that home prices are up – but just how much has yours gone up? Stop wondering or guessing! Ask for your FREE Phoenix home evaluation and receive a complete full-color analysis (about 20 pages) – by email within 24 hours – showing you an exact estimate for your home, along with a HI/LO selling range (based on features and upgrades you may have), plus a rating of how accurate this estimate is on a scale of 1 to 5. 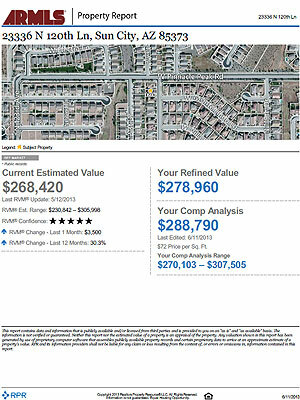 Your Phoenix home value report is FREE, in full-color, includes a specific value and a price range along with a confidence indicator. All this with zero obligation to you. Can an online “guesstimate” match those benefits? According to Zillow: Our estimating method differs from that of a comparative market analysis (CMA) done by real estate agents. Geographically, the data we use is much larger than your neighborhood. Often times, we use all the data in a county for calculation. Does that sound like their estimate is going to track the detailed activity in your neighborhood? We don’t think so. Our FREE property evaluation also factors in homes listed for sale and those under contract that have not yet closed. This allows for more data in the analysis and typically more data means more accuracy. Just how accurate is a Zestimate anyway? Zillow claims their margin of error is 4.5%. With the average home in Phoenix currently selling for about $330,000 that’s kind of a big deal isn’t it? Unless you find $15,000 to be a rounding error! Need more convincing? If you are in the market for a realtor to help you sell your home, consider this: we won’t just promise to sell your home, we’ll guarantee to sell your home within 67 days, at a price acceptable to you, or we will pay you $1000. We set ourselves apart from agents by being accountable to you! If you would like more information about our special seller program, visit Sold in 67 Days for details. Enter this code to get your FREE report emailed within 24 hours!